The last preparatory step before the actual decryption of CardSpace (bet you've thought it would never end :) is necessary to obtain user's Master Key. In Windows Vista, user's Master Key is located by default in the folder: C:\Users \%USER%\AppData\Roaming\Microsoft\Protect\%SID%. Master Key name will be set by the application automatically. 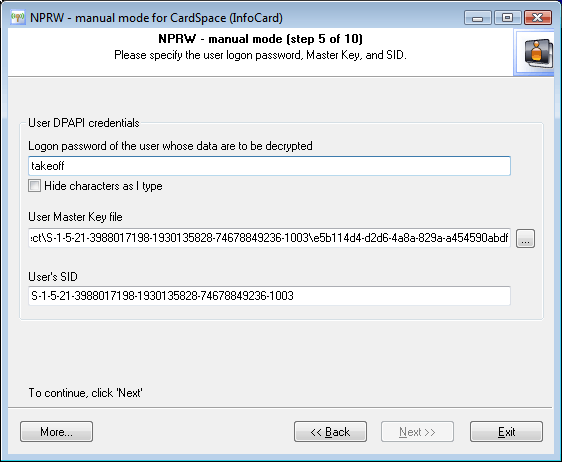 CardSpace owner's account password and its SID, which normally matches with the name of the %SID% folder, are involved in the decryption of the user's Master Key. Once we are done with the user's Master Key and with all the necessary data in our hand, we can finally get on the decryption of CardSpace.